For once I’m going to shut up about my own food and tell about some really great stuff Baltimore has to offer. Last weekend, my husband surprised me with an anniversary outing. It was the Washington Capitals’ last home game, and rather than listening to it on the radio, he took me out to the Heavy Seas Alehouse. This is just our kind of romance. Heavy Seas is our favorite craft brewer. It helps that all their goods are pirate themed, since I’m the kind of girl that normally makes her picks by label. Don’t let me fool you; the tap room is adorned with all sorts of medals won at beer festivals, and their Loose Cannon IPA was recently named #7 in the country by Paste Magazine. While you’re there, make sure to check out the Desert Island series. Every two months, they reveal a new beer to be served only in the Taproom, and at their Alehouse up in Canton. I was very sad to see I’d just missed their Scottish Ale (one of my favorite kinds of beer) but was greatly impressed by the new Schwarzbier. This dark lager packs a lot of flavor into a pint. My husband delighted in their new session IPA, Cross Bones. When we were there (and I’m assuming for a limited time) they were offering it on cask, with a special variation that uses equinox hops. He’s a hop head, so he loved it, and while I enjoyed a sip myself, I’ll stick with something a bit maltier. Overall, there isn’t a beer of theirs I don’t like. If you’re in the neighborhood, stop by the tap house at 4615 Hollins Ferry Rd. in Halethorpe. If you’re feeling charitable, stop in on April 22, when two dollars from every pint will go toward Tour de Cure, a cycling event to support the American Diabetes Association. For more information, click here. Now, what’s a good beer without food to go with it? 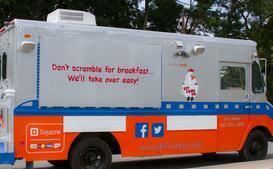 Like many craft tap rooms, Heavy Seas teamed up with a local food truck to satisfy the hunger of its patrons. Get Food Go hits the spot Wednesday to Sunday at Heavy Seas. Serving breakfast all day, they offer the amazing Camden, a fried egg sandwich with cheddar and a choice of breakfast meat – options range from turkey bacon to scrapple – on a baguette. I think I could eat a Camden every day and never get tired of it. They’re that good. Other breakfast options include omelettes, bacon and eggs, and a sandwich they call a Sloppy Boh – a beer brat with a sunny-side-up egg, and provolone. Speaking of breakfast, they also offer the local small batch roaster, Zeke’s coffee. I didn’t order it from them, but I’ll attest to its quality. So I guess ordering a coffee with your sandwich would help you support three local businesses, and all in one place! If you’re not in the mood for breakfast, no problem. From their exclusive-to-Heavy Seas Coddie, to their cheesesteaks and burgers, there’s something to fit every appetite. 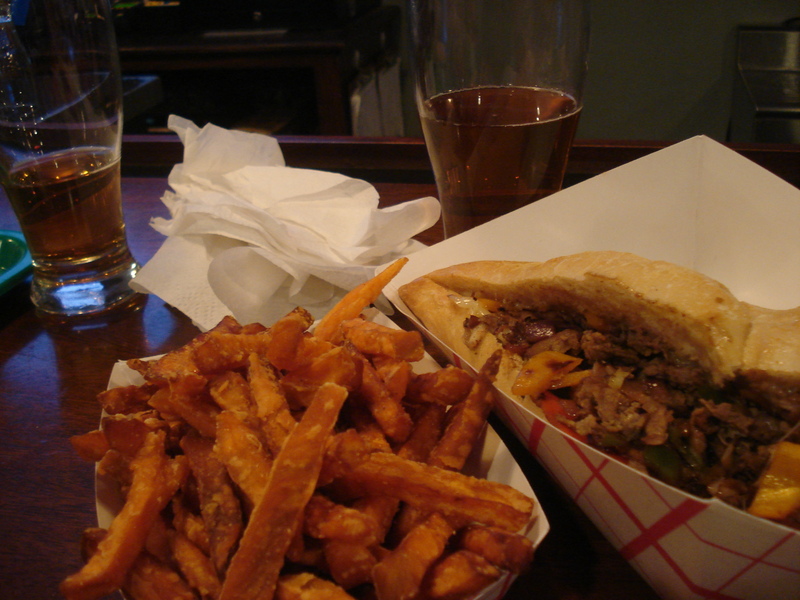 I got a cheesesteak with onions and peppers, and it was cooked to perfection and spot on. My darlin’ delighted in his classic burger, it was everything you’d think of when you hear the words “classic burger” and better. The fries were exquisitely done, crisp on the outside and soft on the inside. But the thing that I really noted about all this, was absolutely nothing we ate was greasy. That’s a surprise, since most other cheesesteaks I’ve had were so greasy the bread was soaked through. This one let me taste the actual sandwich components. No grease, all flavor. And great beer, too. Other sandwiches are more daring than what we ordered, including a “Chipow Burger” with caramelized onion, blue cheese topped with a chipotle pepper and Heavy Seas’ own Powder Monkey pale ale. If you’re you love to think outside the box, give the “PBJBC” burger a try, featuring bacon, cheddar, with peanut butter and jelly. The “Go Burger” topped with a fried egg and jalapeno mayo sounds good enough that I almost want to go back for it now. I’m just going to have wipe the drool off my keyboard instead. The Caps didn’t win, but that’s all right. They still made the playoffs, facing the Islanders in the first round. At least we had some amazing eats, right?